Prices starting at $199, launching June 29. Nvidia is clearly going after the high-end GPU market with Pascal GP104 cards, with GTX 1080 and GTX 1070 both delivering better than Titan X levels of performance in our testing. AMD's response with Polaris 10/11 won't be direct competition, but instead AMD is going after the mainstream market. We can't talk about everything we've been told right now, but much like what Nvidia did with the GTX 1070, AMD is releasing the following key details today. Right off the bat, we see plenty of things that tell us about positioning. AMD lists 36 Compute Units, and unless they're changing things with Polaris, they've used 64 'shader cores' in every GCN CU to date, that would be 2304 cores. That's fewer CUs than the R9 390, but almost 30 percent more than the R9 380. The price is perhaps the most important aspect, however: starting at $199. Presumably that will be the 4GB model, with 8GB models carrying a moderate price premium—somewhere between $20 and $50 would be about right, given current 2GB vs. 4GB pricing. The most important number in all of this right now is probably the TFLOPS, which AMD states as >5 TFLOPS. Again, that's about in line with the R9 390, at a significantly lower price and power level. If you're wondering about clock speeds, like Nvidia architectures, peak TFLOPS on GCN ends up being two 32-bit FLOPS (FLoating-point Operations Per Second) per core, times the clock speed. Working back from the >5 TFLOPS and CU number, we get a minimum estimate of 1085MHz. Except, the greater-than sign suggest that AMD hasn't finalized clock speed yet, so it could be 5.1 TFLOPS or 5.9 TFLOPS (~1280MHz) once the card hits retail. On the memory side of things, like the GTX 1070, RX 480 will run GDDR5 at 8000 MT/s (2000MHz base, four bits per cycle). We might be tempted to complain about the 4GB and 8GB models, but at this level of performance, 8GB probably isn't going to be strictly necessary—and if you're willing to pay a bit more, you can still get it. The 256-bit bus is a large step down from the R9 390's 512-bit bus, and AMD hasn't officially stated whether they're doing any new forms of memory compression to help compensate. The only other major item worth mentioning is that RX 480 will support DisplayPort 1.3 / 1.4 HDR, a step up from the DP 1.2 in current products. RX 480 will also be VR-ready, with what appears to be similar performance expectations relative to the R9 290/390 cards. 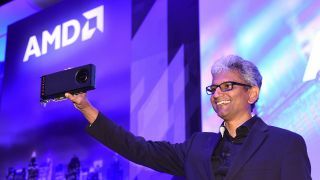 Looking at the bigger picture, those who were hoping to see AMD's Polaris take on Nvidia's Pascal chips will be disappointed. Rather than improving overall performance, AMD is going after the value-conscious gamers. There's nothing wrong with that, and AMD cites Mercury Research data showing 13.8 million people spent between $100 and $300 on graphics cards. Here's the thing: we've been able to get pretty much this level of performance with the GTX 970 and R9 290/390 cards for about a year and a half, only at prices closer to $300-$350. Cutting the price by a third is great, but it mostly matters to those who haven't purchased a faster GPU during the past year or two. Much like our advice on the GTX 1070 preview, we recommend gamers look at skipping a generation—or two if you can manage—between graphics card upgrades. Some will buy a $600 card every two or three years, others will buy a $350-$400 card every few years, and still others will look at a $200-$250 card as a periodic upgrade. So who should be most interested in making the upgrade to an RX 480 once it becomes available? Anyone currently running R7 370 or lower (HD 7870) could potentially double their gaming performance. Or another way of looking at it is that the RX 480 offers roughly the same performance potential as the old Radeon HD 6990 in a card that uses less than half as much power. But that card's five years old now. On the Nvidia side, if you're thinking about switching from team green to team red, GTX 760 and lower (GTX 670 and lower) potentially double performance, not to mention adding some new features and reducing power requirements. We don't have hardware in hand yet, but that should come sometime before the official June 29 launch date, and there will be other new GPUs alongside the RX 480. And even though this may not have the excitement of a $380 Titan X equivalent, the current consoles have to get by on 1.3-1.84 TFLOPS, so now a $199 GPU will basically offer three times the performance potential of a PS4. Next time someone tries to tell you PC gaming is expensive, try putting a $200 GPU in any PC made in the past five years, and you have a much less costly console alternative.